The fourth marketing condition in our series to grow your education brand is brand awareness. The more people who know about you, the more prospective students you’ll attract to your enrollment cycle. Let’s talk about ways to amplify your education brand awareness. Brand awareness is a popular marketing term, so if you want to get to the awareness hacks right now, feel free to skip to the brand amplifiers below! But if you’re new to the term, education brand awareness is how aware your target audience is of your organization — who you are, what you have to offer, and what is important to you. 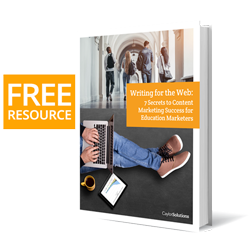 Now, it’s important to think through why increasing your education brand awareness is so important… because you’re going to spend A LOT of your time as a marketer working to create this one marketing condition. Every school — whether you’re a college, university, or k–12 school — flourishes or fails depending on the strength of your recruitment pipeline. Meeting your organization’s KPI’s will mostly come down to the number of conversations your enrollment officers are having weekly with prospectives and their parents. So for us as education marketers, the primary goal, then, is to keep enrollment officers busy with profitable conversations. The straightforward rationale here is that when more people are made aware of the various aspects of your brand — like your brand elements, brand authority, brand authenticity, or brand promise — they will naturally be motivated to make contact with your enrollment team. How motivated they are to contact your enrollment team will depend on the quality of the work you’ve done in each of those branding areas that I’ve already written about. You must have a “product” worth talking about before you try to increase brand awareness. Now that we’ve got a good grasp (or refresher) on the basics behind education brand awareness, let’s dive into these time-tested ways to amplify your education brand. By the way, I’ve listed them in no particular order. You may find some of them more relevant or strategic for your school. How much of a footprint do you have in the digital landscape? Each day, your audience is spending more time online than the day before. They’re looking for the answers to their questions about higher education, their career dreams, or what school is the best for their children. And that’s what makes the digital space so exciting! Not only are you reaching out to build awareness — your audience actively looking to find your content. This makes digital channels unique in that you’re not only building awareness, you can also give your audience a call to action. Since they came to you, and because you’ve shown brand authority through your content, you can naturally ask them to go to the next step in their engagement with your brand. I’ve been blogging about digital education marketing for a while now, so click on the links below to get a better idea of how this tactic can raise awareness of your education brand. LinkedIn Publishing – LinkedIn’s blogging feature lets you post long-form articles straight from your LinkedIn profile, and even allows for rich content like images. It’s a great way to get your blog content out to your alumni who very likely to be connecting with you on LinkedIn more so than other platforms. Social Media Contests — Social media contests attract new eyes to your brand by incentivizing your current followers to introduce your brand to their friends by posting their written stories, pics, or videos about your school using cool giveaway prizes. Podcasts — Any school, but especially higher education, could benefit by getting some of their expert faculty and staff to host a podcast on one of the main academic subjects your school leads. Retargeting (remarketing) — Basically, after a visitor comes to your site, they’ll see your ads showing up in their search engine results and social media feeds. Retargeting is an amazing way to keep your brand in front of people who’ve visited your site, and it’s especially powerful when you only retarget those in your geographic region. EBooks — I’ve seen significant success in lead generation using ebooks as an ethical bribe to get prospective students to opt into your email list. 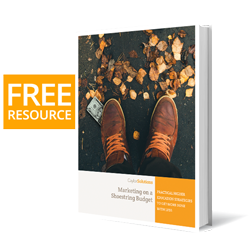 A well-done ebook will increase your leads almost every time. You can use events to increase your education brand awareness by sponsoring or hosting events that engage communities where your audience is most likely to be. These events could be within your local community — but consider putting on or participating in events within areas of your school’s expertise like leadership, tech, or environmental issues. Some schools do an incredible job at referral programs. For example, I have it on good authority that Huntington University has experienced some success in their “Find a Forester” campaign where they offer gifts cards, HU apparel, and other giveaways if their current students somehow connect a friend to Huntington. This may seem gimmicky at first — but think about it. When your lead comes from a current student, they’re more likely to be a qualified prospect as opposed to just anyone who’s happened to hear about you. My own blog has experienced upticks in traffic just by using this simple, but powerful education brand awareness tactic. Find subject matter experts, alumni, and faculty to write for your blog, create videos for your vlog, or share your content in their newsletters. The beauty of this tactic is that your influencers don’t have to be famous to get your brand more exposure. They just need to be respected and established in their circles, which could be as formal as their industry or as informal as their family and friends. Good old fashioned branding isn’t dead! Just make sure that you use images and copy on these physical landscapes that remind people of your education brand more than just showing them your brand. For example, slogans, mascots, and even landmarks are great images that look good on the items that you’re giving away. Form partnerships with local organizations, educational associations, and community initiatives that reinforce or echo your brand values. This last brand amplifier is to BE USED WITH CAUTION. But crafting human, personal qualities into your marketing messages that highlight your brand distinctives can make your brand so sticky, your audience will never forget you. During his college application days, my son applied to Butler University among several others. In the application, he was asked if he had any pets and what were their names. He replied that we had a dog and a cat and gave their names. That’s a very strange thing to ask in an application. But we forgot about it quickly afterwards. Use the appropriate tone and look when using personality to increase your education brand awareness. Then one day, we received a rather unique communication from Butler U. This kind of light-hearted thoughtfulness to our pets endeared the Butler brand in the Caylor home. In fact, I’m sure I’ve told this story at least 20 times since then! They also did an incredible job of leveraging their admissions communication flow to further marketing their brand. Be very careful how, or even if, you implement this tactic. It should never be done outlandishly. However, good-natured, thoughtful humor can go a long way when it’s locked into one or more of your brand distinctives. Brand amplification is the day in, day out work of marketing. It can be overwhelming, repetitious, or even mundane. Our team of education marketers at Caylor Solutions has decades of experience in education brand awareness strategies. We’re here for you! Feel free to get ahold of us today for a free consultation. How are you raising your education brand awareness? Are you using personality, or events, or some other tactic you saw in my list? Are you using another method that is missing here? Let us know in the comments below!